Researchers at Caltech have discovered how an abundant class of RNA genes, called long non-coding RNAs (lncRNAs, pronounced link RNAs) can regulate key genes. By studying an important lncRNA, called Xist, the scientists identified how this RNA gathers a group of proteins and ultimately prevents women from having an extra functional X-chromosome—a condition in female embryos that leads to death in early development. These findings mark the first time that researchers have uncovered the detailed mechanism of action for lncRNA genes. "For years, we thought about genes as just DNA sequences that encode proteins, but those genes only make up about 1 percent of the genome. Mammalian genomes also encode many thousands of lncRNAs," says Assistant Professor of Biology Mitch Guttman, who led the study published online in the April 27 issue of the journal Nature. These lncRNAs such as Xist play a structural role, acting to scaffold—or bring together and organize—the key proteins involved in cellular and molecular processes, such as gene expression and stem cell differentiation. Guttman, who helped to discover an entire class of lncRNAs as a graduate student at MIT in 2009, says that although most of these genes encoded in our genomes have only recently been appreciated, there are several specific examples of lncRNA genes that have been known for decades. One well-studied example is Xist, which is important for a process called X chromosome inactivation. All females are born with two X chromosomes in every cell, one inherited from their mother and one from their father. In contrast, males only contain one X chromosome (along with a Y chromosome). However, like males, females only need one copy of each X-chromosome gene—having two copies is an abnormality that will lead to death early during development. 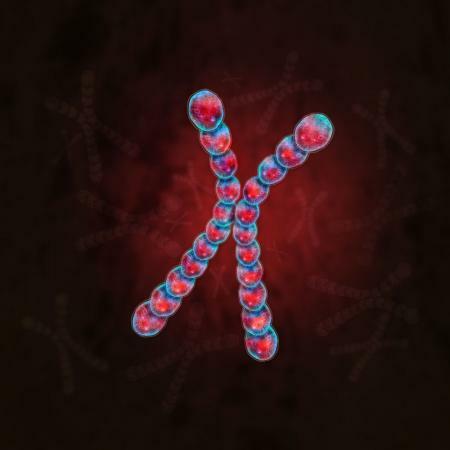 The genome skirts these problems by essentially "turning off" one X chromosome in every cell. Previous research showed that Xist is essential to this process and does this by somehow preventing transcription, the initial step of the expression of genes on the X chromosome. However, because Xist is not a traditional protein-coding gene, until now researchers have had trouble figuring out exactly how Xist stops transcription and shuts down an entire chromosome. "To start to make sense of what makes lncRNAs special and how they can control all of these different cellular processes, we need to be able to understand the mechanism of how any lncRNA gene can work. Because Xist is such an important molecule and because so much is known about what it does, it seemed like a great system to try to dissect the mechanisms of how it and other lncRNAs work," Guttman says. lncRNAs are known to corral and organize the proteins that are necessary for cellular processes, so Guttman and his colleagues began their study of the function of Xist by first developing a technique to find out what proteins it naturally interacts with in the cell. With a new method, called RNA antisense purification with mass spectrometry (RAP-MS), the researchers extracted and purified Xist lncRNA molecules, as well as the proteins that directly interact with Xist, from mouse embryonic stem cells. Then, collaborators at the Proteome Exploration Laboratory at Caltech applied a technique called quantitative mass spectrometry to identify those interacting proteins. "RNA usually only obeys one rule: binding to proteins. RAP-MS is like a molecular microscope into identifying RNA-protein interactions," says John Rinn, associate professor of stem cell and regenerative biology at Harvard University, who was not involved in the study. "RAP-MS will provide critically needed insights into how lncRNAs function to organize proteins and in turn regulate gene expression." Applying this to Xist uncovered 10 specific proteins that interact with Xist. Of these, three—SAF-A (Scaffold attachment factor-A), LBR (Lamin B Receptor), and SHARP (SMRT and HDAC associated repressor protein)—are essential for X chromosome inactivation. "Before this experiment," Guttman says, "no one knew a single protein that was required by Xist for silencing transcription on the X chromosome, but with this method we immediately found three that are essential. If you lose any one of them, Xist doesn't work—it will not silence the X chromosome during development." The new findings provide the first detailed picture of how lncRNAs work within a cellular process. Through further analysis, the researchers found that these three proteins performed three distinct, but essential, roles. SAF-A helps to tether Xist and all of its hitchhiking proteins to the DNA of the X chromosome, at which point LBR remodels the chromosome so that it is less likely to be expressed. The actual "silencing," Guttman and his colleagues discovered, is done by the third protein of the trio: SHARP. To produce functional proteins from the DNA (genes) of a chromosome, the genes must first be transcribed into RNA by an enzyme called RNA polymerase II. Guttman and his team found that SHARP leads to the exclusion of polymerase from the DNA, thus preventing transcription and gene expression. This information soon may have clinical applications. The Xist lncRNA silences the X chromosome simply because it is located on the X chromosome. However, previous studies have demonstrated that this RNA and its silencing machinery can be used to inactivate other chromosomes—for example, the third copy of chromosome 21 that is present in individuals with Downs' syndrome. "We are starting to pick apart how lncRNAs work. We now know, for example, how Xist localizes to sites on X, how it silences transcription, and how it can change DNA structure," Guttman says. "One of the things that is really exciting for me is that we can potentially leverage the principles used by lncRNAs, move them around in the genome, and use them as therapeutic agents to target specific defective pathways in disease." "But I think the real reason why this is so important for our field and even beyond is because this is a different type of regulation than we've seen before in the cell—it is a vast world that we previously knew nothing about," he adds. This work was published in a recent paper titled: "The Xist lncRNA interacts directly with SHARP to silence transcription through HDAC3." The co-first authors of the paper are Caltech postdoctoral scholar Colleen A. McHugh and graduate student Chun-Kan Chen. Other coauthors from Caltech are Amy Chow, Christine F. Surka, Christina Tran, Mario Blanco, Christina Burghard, Annie Moradian, Alexander A. Shishkin, Julia Su, Michael J. Sweredoski, and Sonja Hess from the Proteome Exploration Laboratory. Additional authors include Amy Pandya-Jones and Kathrin Plath from UCLA and Patrick McDonel from MIT. The study was supported by funding from the Gordon and Betty Moore Foundation, the Beckman Institute, the National Institutes of Health, the Rose Hills Foundation, the Edward Mallinckrodt Foundation, the Sontag Foundation, and the Searle Scholars Program.